NEW YORK, NY--(Marketwired - May 16, 2016) - Chinese direct investment in U.S. real estate has grown dramatically and visibly since 2010, according to a new report by Asia Society and Rosen Consulting Group (RCG) titled Breaking Ground: Chinese Investment in U.S. Real Estate. 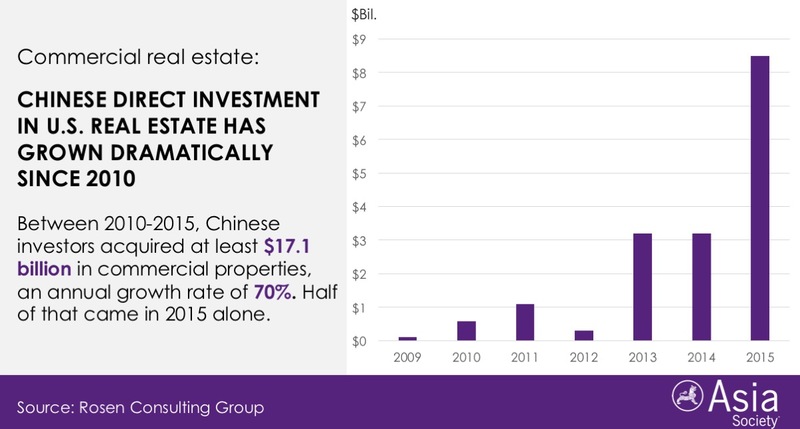 The report provides the first comprehensive analysis of Chinese inbound investment into all areas of U.S. real estate. It finds that more than any foreign investor other than Canada, China stands out for the breadth, depth, and speed of its participation in the U.S. real estate market. According to the report, Chinese investors acquired at least $17.1 billion of existing commercial property between 2010 and 2015, representing an annual growth rate of 70%. Half of that investment came in 2015 alone. 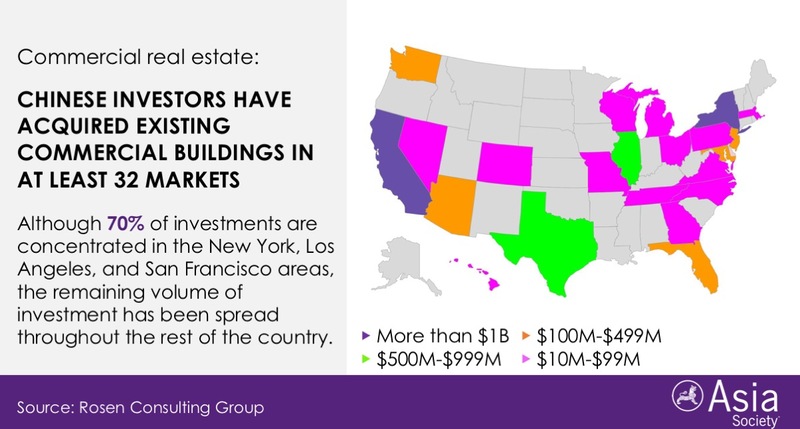 While 70% of commercial real estate transaction value between 2010 and 2015 was concentrated in the New York, Los Angeles, and San Francisco metro areas, the remaining volume is spread widely throughout the rest of the country. Chinese buyers spent at least $93 billion on residential real estate between 2010 and 2015. Spending rose at an annual rate of 20% and provided important demand in many local markets hit by the housing crisis. California accounted for 35% of Chinese home purchases in 2015, followed by Washington state with 8% of sales, and New York at 7%. These markets correlate well with the availability of direct flights from China and established Chinese and Chinese American populations. Chinese capital has had a significant impact on the U.S. economy and jobs, the report finds. Chinese-funded projects under construction or planned totaled at least $15 billion by the end of 2015. These range from multi-billion-dollar mixed-use projects in Los Angeles and the San Francisco Bay Area to smaller-scale developments in secondary markets. 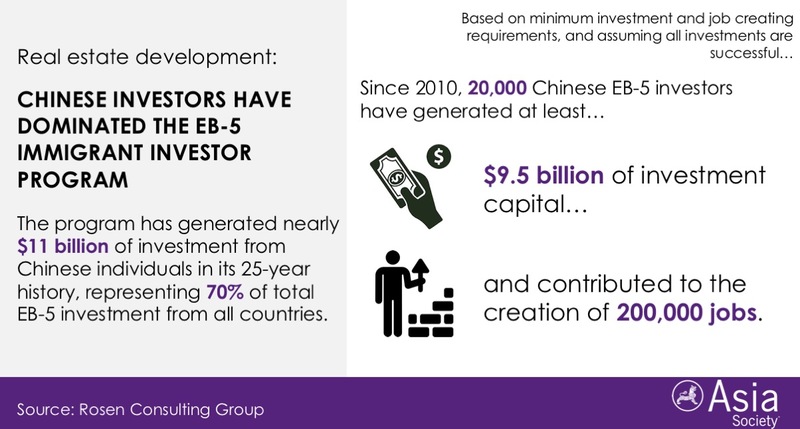 The report also estimates that the EB-5 immigration visa program has generated at least $9.5 billion of Chinese investment capital and contributed to the creation of 200,000 jobs since 2010. Despite China's recent economic turbulence, the volume of investment in U.S. real estate will continue to grow. In the short term, capital controls will likely slow individual purchases of U.S. homes, the biggest component of Chinese real estate investment, and slow the growth rate of commercial property acquisitions. 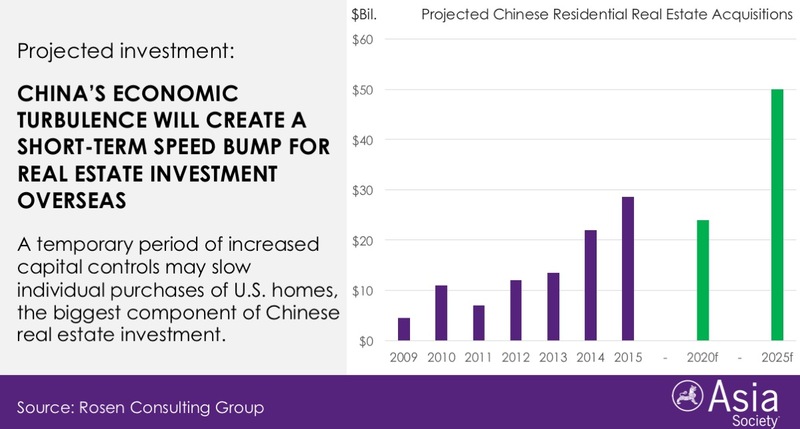 Chinese direct investment across existing U.S. commercial real estate assets and residential purchases excluding new development projects, however, could still total at least $218 billion, cumulatively, from 2016 through 2020. Beyond 2020, Chinese investment in U.S. real estate could accelerate further, thanks to a widening pool of Chinese investors, many of whom have not ventured into U.S. real estate; increasing global appetite by Chinese developers and construction companies; a $1.6-trillion insurance industry that has become active overseas but invested just a fraction of funds available for real estate projects; and new Chinese investment vehicles such as private equity funds. "This wave of investment is coming from diverse sources in China," said Arthur Margon, a partner at RCG and one of the authors of the report. "But that's really a small piece of the potential investor universe." Breaking Ground combines information from public records, reports, and trade groups with RCG's database, based in part on gathering of data and interviews with industry sources. The report also presents discussions of the motivations and drivers for various Chinese investors; benefits and impediments posed by this wave of investment; analysis and projections of the sustainability of Chinese investment in commercial and residential property; and recommendations for U.S. and Chinese investors, policy makers, and stakeholders to keep investment channels open. "Policymakers, business leaders, and the general public in the United States still do not have a comprehensive understanding of the patterns and implications of Chinese investment in the United States," Bruce Pickering, VP, Global Programs, Asia Society and Executive Director, Asia Society Northern California and Jonathan Karp, Executive Director, Asia Society Southern California write in the report's introduction. "This report paints a clearer picture of what these investments mean for this country." Breaking Ground is the fourth report in a series dating back to 2011 that looks at the broader phenomenon of Chinese investment in the U.S. The past reports, produced as a partnership between Asia Society and Rhodium Group, have looked at foreign direct investments from China at the national level and in California, and at investments in the high tech sector. Asia Society is the leading educational organization dedicated to promoting mutual understanding and strengthening partnerships among peoples, leaders and institutions of Asia and the United States in a global context. Across the fields of arts, business, culture, education, and policy, the Society provides insight, generates ideas, and promotes collaboration to address present challenges and create a shared future. A nonprofit, nonpartisan organization, Asia Society is headquartered in New York with state-of-the-art cultural centers in Hong Kong and Houston, and offices in Los Angeles, Manila, Mumbai, San Francisco, Seoul, Shanghai, Sydney, and Zurich. Rosen Consulting Group (RCG) is the leading independent real estate economics consulting firm. Founded in 1990 and with offices in Berkeley and New York, RCG provides strategic consulting and unbiased investment guidance through all market cycles. RCG is a trusted advisor to leading banks, insurance companies, institutional investors, and public and private real estate operators.